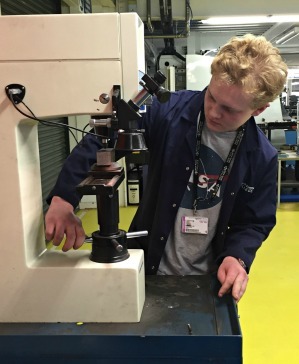 The Engineering and Technology Department at Milton Keynes College is giving students practical experience in hardness testing using a CV-700 INNOVATEST universal hardness tester from Bowers Group. Based within the Chaffron Way Campus in Leadenhall, the Engineering and Technology department offers a variety of courses covering a wide span of ability levels. The impressive multi-million pound Innovation and Technology Centre allows students to study mechanical, electronic, computer-aided design or fabrication, leaving the college with the most up-to-date skills for the demands of today’s manufacturing industries. Students range from school leavers with aspirations of employment in the field, to individuals already working in an engineering department looking to increase their skill set. The CV-700 INNOVATEST hardness tester allows students to carry out reliable Rockwell, Brinell and Vickers hardness testing on a variety of metallic materials. As well as teaching them how to perform the various stress analysis tests on metallic surfaces, the students are encouraged to think critically about the identification of metals including aluminium, brass, and mild and hardened steel using the results of the hardness tests. The college uses magnifying cameras in conjunction with the hardness tester, allowing the results to be projected onto whiteboards using an overhead projector for teaching purposes. Full tests carried out on the CV-700 are also filmed, enabling them to be shown to larger groups of students as instructional videos. Students are tested on their ability to use the machine correctly during practical exams, where they are expected to perform accurate testing of metals under examination conditions. The CV-700 is an analogue universal hardness tester with a solid design, suitable for carrying out reliable Rockwell, Brinell and Vickers testing. The simple test cycle by operation lever allows a wide test load range up to 187.5kgf.